Over 100 cancer patients pronounced uncurable by the conventional Western medicine have been able to live an almost normal life thanks to decades of efforts of a researcher, who made enzymes out of fermenting medicinal herbs. For the last four decades Mr. Kim Sung-Nam, Director of Joongang Oriental Medical Clinic at Seoul's Yongdap-dong has been curing termimally ill patients with enzymes he makes out of fermentation of Oriental herbs. 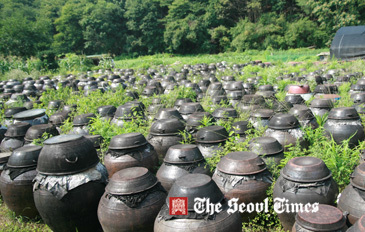 At his research center in Yangpyeong in Gyeonggi Province are thousands of big jars where enzymes mature over a period of 10 years, 20 years, and sometimes even 30 years. The Joongang Oriental Medical Clinic has been renowned for its expertise and experience in the treatment of cancer and other terminal illnesses by the enzymes Director Kim makes. To find out his secrets The Seoul Times has recently interviewed him at his research center in Yangpyeong. During the interview with him at his garden, his love for nature could be felt. Director Kim had previously spent three years living at the mountain ranges until the age of 29 and was subsequently married at the age of 36. “I use these large pots for the fermentation process of enzymes so as to eliminate unwanted micro-organisms present in raw materials and equipment,” he said. Under the teaching of Prof. Yamamoto of University of Tokyo, this humble gentleman made a name for himself after decades of research work. “I work closely with long established organizations such as Pulmuone Co. Ltd. and a top-notch organic company located at Paldang,” Director Kim went on saying. Below are the questions and answers to the interview Chairman Kim had with The Seoul Times. Q1: What is your philosophy of life? A1: I live by the principle of sharing what I have with others. I am currently sponsoring poverty-stricken children under the World Vision Organization and hope to be able to support up to 100 of them in future. As a Christian, I would also like to spread my beliefs to others and be a role model to the community. Q2. Can you tell us more about what enzyme is? A2: The word“enzyme”comes from the Greek word “enzymes,” which means “leavened” or“fermented.” Enzymes also known as abnormal cells or mutated cells have the ability to kill germs. There are over 2000 enzymes in our body such as the digestive enzymes and metabolic enzymes which are instrumental to our body functioning. Enzymes break down components from food so that our body can benefit from these nutrients and turn the food we consume into energy. Cells are the basic structural and functional unit of all living organisms and enzymes help catalyze and regulate all biochemical reactions occurring in these living cells. While enzymes can be created artificially using grains, fruits, vegetable roots, seaweed and minerals; a higher grade of man-made enzymes involves the additional use of weeds in the making process. These enzymes also help to improve the immune system functions. The sustenance of enzymes in our body is necessary for maintaining our health through breaking down food into nutrients adequately and for our digestive system to function optimally. Q3: What role do enzymes play in the treatment of diseases such as diabetes and hypertension? A3: All enzymes are responsible for the existence, maintenance and extinction of life. As enzymes are capable of triggering illnesses like diabetes and hypertension, they play an important role in the treatment of such illnesses. Q4: What do you think of using alternative medicine in the treatment of cancer? A4: Even though there is no direct relation between the use of enzymes and the treatment of cancer, it is necessary for doctors practising alternative medicine to understand the functions of the three elements: enzymes, cells, and micro-organisms. The present use of enzymes in the practice of natural or conventional medicine will also be the key to the development of using alternative medicine in the treatment of cancer in future. In reality, each one of us has approximately 3,000 to 5,000 cancerous cells in our body. Natural killer cells in our body also known as NK cells help to kill these cancerous cells with the help of enzymes and thus building up our immune system and maintaining our health. The Joongang Oriental Medical Clinic is located at the Taeyang Apartment, opposite Sindap Station; Dapsipli, Dongdaemun-gu in Seoul.